So you’ve decided to take an inbound marketing approach. There are a lot of components to an inbound strategy…email marketing, nurturing, social media, analytics, SEO…and of course, content. Content - while clearly not the only component, is a big one and can be the most daunting element of your approach. Content creation can seem like a very scary and overwhelming task but there are things you can do to make it easier. Here are three things to get you started on your way to becoming a content creation superstar. 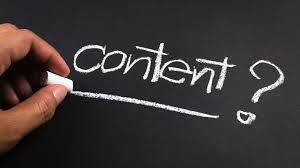 According to Content Marketing Institute and MarketingProfs, 2015 Benchmarks, Budgets and Trends – North America study, only 35% of content marketers have a documented content strategy. Sounds crazy, right? How can they deliver consistent content to their audiences without a documented strategy? Truth is – they can’t. Not only will documenting your strategy help you to stay organized and create content faster, it will also help you stay focused on the messaging you identified for each one of your buyer personas. Your content needs a purpose. Its purpose is to move your personas through their buyer’s journey and the only way to do that is to stay focused and relevant. There are many tools available but the cheapest and easiest is a simple spreadsheet. List your personas down the Y axis and the stages of the buyer’s journey across the X axis. Fill in the boxes with the types of content needed to move the personas from one phase of their buyer’s journey to the next. This will include blog posts, checklists, white papers, e-books, video, etc. Why re-create the wheel? Chances are your organization has loads of content that was created for many purposes. Case studies, brochures, proposals, presentations, your website and even manuals are all great sources of content. Use a simple spreadsheet to Identify and document every piece that exists and then determine how it can be re-tooled for your inbound approach. For example, you may have a great info-graphic from a proposal that clearly defines a process your organization uses with every customer. Add it to your spreadsheet and mark that it can be used as is. When your audit is complete, compare what you have with your strategy table and start thinking about how it will be used. Have the information ready when you start #3. Your strategy is defined and your audit is complete. Now it’s time to determine what specific pieces will be created by who and when. Using the spreadsheet you already created as part of your content strategy, brainstorm ideas with your team for each piece of content you’ve identified as key for moving your buyer’s down the funnel. For example, if you’ve identified a checklist as an important piece of content, identify the topic. It may be an answer to a frequently asked question or a simple list of things to consider about your product or service. It may be something you already have in your content library. Whatever it is, document it, assign it and give it a due date. It will be important to build out your content in an organized way. Make sure that each time you create a piece and publish it, you have the follow-up pieces ready to go or at least in process. Content creation can seem like a monumental task but simple planning and documenting can make things a lot easier.